Egypt Uprising Against MB Terrorism And The World Who Support MB terrorists. Egyptians don’t care anymore about who think what happened in Egypt on the 30 of June 2013 whether it was a military coup or a popular coup against terrorists who were ruling our country, because we are not going to prove to the world what they have already seen whether it was a revolution or not. We don’t care what do you think any more. This is a message to the whole world who are supporting Muslim Brotherhood Terrorists as well as to Muslim Brotherhood, it’s our kids who are getting bombed every day, it is our kids who are getting kidnapped, tortured and killed every day by brotherhood terrorists. Terrorists that you are supporting and putting pressure on The military to release them without any trials for all the crimes they have committed and all the blood shed which is not dry yet. Those who are getting killed are not your kids and we know that you don’t care as long as they are not yours. Your dirty policy in our middle east region was destroyed by Egyptian people’s willing and your support for Muslim Brotherhood terrorists and killers are going to be destroyed by our willing and uprising on the 26 of July 2013 against any country and every country who support Muslim Brotherhood criminals. If you guys think that the 30 of June or the 3rd of July 2013 was the biggest masses you have ever seen in history, you are mistaken, watch us and wait for that day, it can only happen in Egypt. Do you think that Egyptians can accept your poisoned peanuts aid? The hell to you and to your aid. Our dignity is more precious than your aid. You really have the guts to interfere with insolence in our internal affairs! You claim that you are the sponsor of freedom of speech and liberty and democracy, do you think that Egyptians are morons? You invaded our Arab countries with that big cover of lie on your own people claiming that it was your fight against terrorism and we either with you or with terrorism! Now, we are telling you, you are either with us or with Muslim brotherhood terrorists. The relationship between the Egyptians and their military is very hard for you to understand, because you guys think that all Egyptians are traitors to their own countries like the Brotherhood who have made dirty deals with you to sell a land they don’t own, and to rule with slavery,dictatorship and oppression a huge population they did not inherit. We are having a war against terrorism right now and any body who will support those terrorists, is Egypt’s enemy. The world and on top of it the USA use a dirty double standard, treating us as if we are animals, as if we don’t deserve but disrespect because you think that we believe all your lies about your sponsorship for democracy and liberty, You lie even to your own people about what happen in this middle east part of the world. The truth is, you are spreading hate in our hearts towards your countries, you are spreading anger in our hearts against your dirty policies. When a citizen of yours lives in an Arab country and does n’t show respect for the country’s rule and go to jail for it, you turn the world up side down for that citizen, no matter what they commit in breaking our countries rules, like that case happened in UAE with that Norwegian woman who disrespected the rules of the UAE and in order to get away with it, she claimed that she was raped!, or like that case of foreign financing during the 25th of January revolution, paying money for some organizations to ruin our country and direct the country to where you want it to be to suit your interests. Or like your invasion to Iraq under the claim of mass destructive big lie weapons! how is democracy and freedom fries doing in Iraq nowadays by the way! How is the Iraqis Oil taste like? does it taste good in your countries? Or like your invasion To Libya! How is the freedom and democracy doing in Libya? is it divided or not yet? And mentioning invasion to our Arab countries, poor Syria, they don’t have any oil or any corn oil either! when are you going to invade? do they really worth the financing or invading? No I don’t think so, they don’t have anything that you guys have any interests in. Besides, their military is already divided. What is left in the whole region? Iraq, Syria and Libya were considered powerful countries and had strong military, they are all gone with the wind of invasion. What is left in the region? Egypt, and the Egyptian military….You can always dream of destroying our military but you will never succeed with it! The balance of power is in our street, the balance of power is the Egyptian people. Maybe we don’t have a strong economy yet, and we are not the most powerful country in the whole world yet, but we have something, you guys don’t have, our solidarity and union and the attachment of blood, language and religion whether Coptic or Muslim, we are all one hand against any country who interfere in our affairs or try to put pressure on our military to release the terrorists that you support without any trials. All the Egyptian people are uprising against Muslim Brotherhood terrorists, and against the whole world when it is necessary. All political parties in Egypt with all their directions and believes are supporting and authorizing the Military in their war against Muslim Brotherhood terrorists. All union labors in Egypt are supporting and authorizing the Military in their war against Muslim Brotherhood terrorists. All Tourism, trades, private and public sectors are supporting and authorizing the Military in their war against Muslim Brotherhood terrorists. 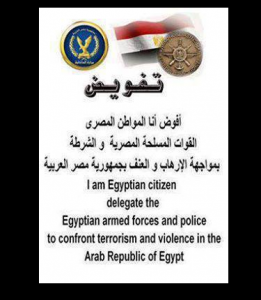 All cities in Egypt without any exceptions, 28 cities in the republic of Egypt are supporting and authorizing the Military in their war against Muslim Brotherhood terrorists. All Political activists including Tamarud campaign are supporting and authorizing the Military in their war against Muslim Brotherhood terrorists. And above all those, you will see 84 millions in the streets on the 26 of July 2013 supporting and authorizing the Military in their war against Muslim Brotherhood terrorists. The Egyptian military who protected us from Muslim Brotherhood criminals and terrorists and protected our 30th of June revolution, and they are paying now daily from their own life and blood the price for saving our souls and country, getting daily bombarded and assassinated by Brotherhood criminals that you are supporting against us and against our country and against our willing.